The Tánaiste has announced that the referendum on the fiscal treaty will take place on Thursday 31 May. A Referendum Commission is likely to be established to oversee the public information campaign in the run-up to the vote. Eamon Gilmore announced the date in the Dáil this afternoon, after the Cabinet approved the timing of the vote. Arriving at Government Buildings this morning, Mr Gilmore said the referendum campaign will be about the stability for the euro and the Government will make that case to the people. Fianna Fáil leader Micheál Martin said the announcement brought clarity to the issue and he said his party would be supporting a Yes vote. Mr Martin said that given the short timeframe it was important that a good information campaign be launched. He asked the Government to bring out a White Paper. Sinn Féin leader Gerry Adams said the Government had tried to avoid a referendum and he said Sinn Féin believed it to be a bad treaty. Mr Adams said the treaty would cost the country an extra €6bn in cuts and it will give too much power to unelected administrators in Brussels. He said his party would be campaigning vigorously against it. Socialist Party leader Joe Higgins said the treaty would mean permanent austerity. Mr Higgins asked the Government to explain why a clause was inserted in February blocking access to EU funds in the event of a No vote, the so-called Blackmail clause. 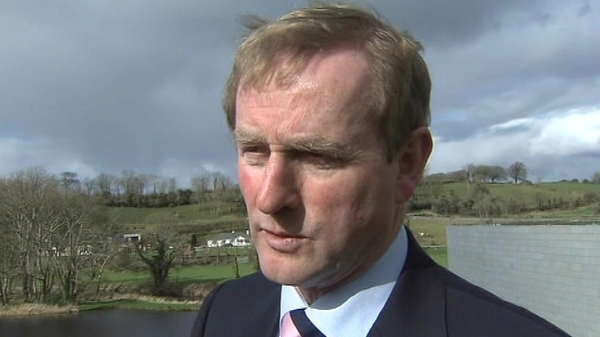 Elsewhere, the Taoiseach has said that he is quite sure that the people will vote positively in the referendum. Speaking in China, Enda Kenny said ratifying the treaty was a matter of good housekeeping, as no one would ever want to see a situation again where a Government could run riot with the people’s money and the people’s future. Mr Kenny said that a Yes vote would be a statement of confidence about the future of Ireland. The latest indication of public opinion came in a Red C poll at the weekend in the Sunday Business Post, which showed a reduction in the number of undecided voters to 18%. After they were excluded, the Yes side was ahead of the No side by 60% to 40%.